The Sri Lanka Journal of Food and Agriculture (SLJFA) was launched in 2015 and published two issues each year. 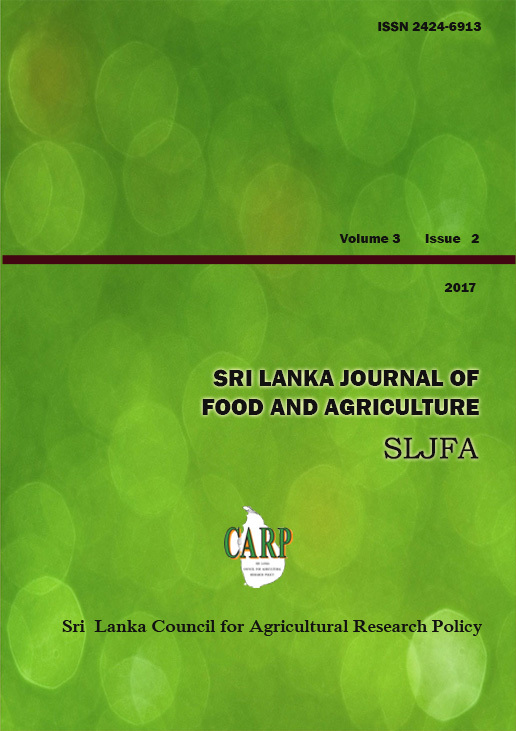 The SLJFA is the official journal of the Sri Lanka Council for Agricultural Research Policy (SLCARP) of the Ministry of Agriculture, the Democratic Socialist Republic of Sri Lanka. The journal invites quality articles from all branches of research that uncovers the mechanisms and intricacies related to various fields of study that addresses the challenges of national, regional as well as global agriculture and food security. The journal considers cutting-edge contributions across the relevant academic disciplines, including agricultural, ecological, environmental, nutritional, and socio-economic sciences, public health and policy, that critically contribute to address sustainability issues on agriculture and food systems in all scenarios. The SLJFA creates a vibrant platform for showcasing original research, scientific communications and reviews to a broad-ranging readership. The journal does not charge page fees or access fees. The management system of the journal is well established and assures a speedy publication through a rigorous review process. The SLJFA follows a double-blind review process to ensure quality and relevance of the papers it publishes. The SLJFA guarantees the experience of timely and quality publication to the scientists worldwide. Papers accepted generally deals with holistic, quantitative or qualitative systems approaches to a range of problems within food and agriculture systems and their interactions with other systems. The content of papers should be properly introduced, presented and discussed to readers from a wide range of disciplines. The scope of the journal includes policy, systems analysis, methodologies and novel technologies, technology transfer and the relationship among them. The journal publishes original scientific papers and short communications. Review articles and book reviews are accepted only by invitation from the Editorial Board. The papers submitted will be reviewed by three subject experts. The journal adopts a double blind reviewing policy, where both the referee and authors remain anonymous throughout the process. Manuscripts should be prepared using MS Word (version 2007 or higher). The Figures and Tables should be placed at appropriate locations in the text and also be submitted in separate files identifying them by the Table or Figure Number. The text should be in single-column format. All text should be done in Times New Roman, 12-point, and 1.5 spacing excluding Tables (single spacing). The maximum length of the manuscript should be 15 A4-size paper. The title of Tables, caption of Figures, data presented in Tables and the list of References should be in Times New Roman 11-point, single spacing. Submission of paper not withstanding to the guidelines will be returned to the authors without being considered for review. Submission of a manuscript implies that the work described has not been published before and is not under consideration for publication anywhere else. Generic names of drugs and pesticides should be given. If trade names are used, the generic name should be given at the first appearance. Footnotes for the pages are not allowed. Sub-headings are not permitted in the Abstract, Introduction, Conclusions and Acknowledgements. Sub-headings in other sections should be in lower-case and bold-font. All materials should be in black and white. The corresponding author is responsible for submitting clear and legible material for publication. Colour Figures, Photos and Artwork are accepted only under special circumstances as decided by the Editorial Board. Ensure that each illustration has a caption immediately below. A caption should comprise a brief title (not on the figure itself) and a description of the illustration. Explain all symbols and abbreviations used. Digital versions of Figures, preferably in TIFF format, should be sent separately. Figures should be presented with appropriate statistical inference. Number the Figures consecutively as they appear in the text. Data presented in tables should not be repeated in Figures, or vice versa. Prepare Tables only by using the Insert Table function. Do not use Tabs within tables or any other software to produce Tables. Place notes below the Table and indicate them with a superscript or lowercase letters. Data presented should have appropriate statistical inference. Number the tables consecutively in accordance with their appearance in the text. Use the equation editor for equations. Always use internationally accepted signs and symbols for units (SI units). Should include the experimental materials, sampling procedures, experimental methods, experimental design and number of replicates and statistical methods adopted. Standard protocols should not be described in detail. List those individuals or organizations who provided help during the research (e.g., providing funds, language help, writing assistance or proof reading the article, etc.). Ensure that every reference cited in the text is also present in the reference list (and vice versa). The purpose of the proof is to check for typesetting or conversion errors and the completeness and accuracy of the text, tables and figures. Substantial changes in content, e.g., new results, corrected values, title and authorship, will not be allowed. Madigan M.T., Martinko J.M., Dunlap P.V. and Clark D.P. (2008): Brock Biology of Microorganisms, 12th Edition. New York, USA: Pearson Higher Education. Finlay B.I., Fenchel T. and Embley T.M. (1993): Methanogen endosymbiosis in anaerobic climates. In: Trends in Microbial Ecology (Guerrero, R. and Pedros-Alio, C. Eds.). pp 285-288. Barcelona: Spanish Society for Microbiology, Spain.